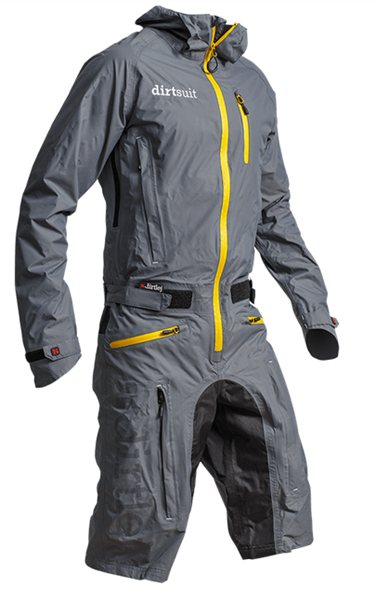 Product information "Dirtlej Dirtsuit Classic Edition grey/yellow"
Even if it is really scary outside - with the dirtsuit even the best excuse does not help anymore. The waterproof, breathable bike one-piece defies rain or slush, allowing a wonderful mud fight on the trail. The perfect companion for rainy, muddy days. Dirt and water have little chance against him - with the dirtsuit classic edition the weather jacket is like pants. In addition to the six generous air intakes, 10,000 g / m2 / 24h breathability ensures good air permeability. High-quality material and welded seams brace themselves against the wind. With a 10,000 mm water column and sealed zippers, the monsoon can come! Never again dirt between pants and jersey! Just take off and be relatively clean. Through its various air inlets, the temperature can easily regulate the road. S corresponds to the previous size M.
Related links to "Dirtlej Dirtsuit Classic Edition grey/yellow"
Customer evaluation for "Dirtlej Dirtsuit Classic Edition grey/yellow"